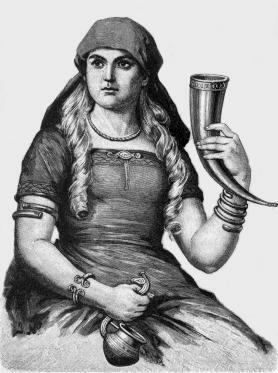 One deity in Norse mythology who is fairly well known but doesn’t feature in very many stories is Sif, the wife of Thor. It’s likely that Sif had another husband prior to Thor, as her son Ull is not mentioned as one of Thor’s children, but it’s not clear. The goddess is mostly famed for her golden hair, which Loki once cut off as a prank. I’ve seen it suggested that Thor and Loki were both interested in her and the trickster was motivated by jealousy, but elsewhere this is just stated to be one of his jokes. There’s another myth where Loki accuses Sif of cheating on Thor with him, but we don’t know whether or not this is accurate. Regardless, Thor was pissed off at Loki for shaving his wife bald, and threatened physical harm. The prankster agreed to restore her hair, and did so by having the dwarves make a new head of hair for Sif. So I suppose she technically wears a wig, but dwarf craftsmanship is good enough that I doubt anyone notices. Scholars consider the loss and restoration of Sif’s hair to be a possible symbol for the death and rebirth of corn and other crops, making Sif a fertility goddess. The only other details I can find about Sif through quick Internet research (admittedly not the most thorough kind) are that she’s sometimes said to have prophetic powers and to be able to take the form of a swan. This entry was posted in Mythology, Norse and tagged aesir, loki, sif, thor. Bookmark the permalink.